Recent news that the late David Bowie’s first recording was found in a bread bin has prompted our latest blog! Unearthed in the Nineties, a 1963 demo tape of David Bowie singing I Never Dreamed will go under the hammer in September. 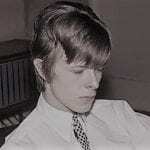 This first known studio recording of the 16-year old Bowie is with his first band the Konrads. It is expected to fetch £10,000, despite being rejected by Decca and never having been released. Every household should have a good quality bread bin (or bread box as they are known in the USA, perhaps a more apt description) because they are incredibly practical. These bread containers keep their contents at room temperature, prolonging edible storage time. They allow air to circulate, reducing condensation and so helping to prevent mould. They are designed and made with a close fit to protect their contents from the smallest of pests. Rustic, retro or contemporary, large or small and preferably made from sustainable wood (yes, we are unashamedly biased! ), there really is a bread bin to suit every environment. And the best designed bread bins make beautiful features too. Don’t go for plastic bags either; apart from the fact there’s already too much plastic waste in the world, they encourage mould. Much better to use either a linen bread bag (as the French have done for centuries) or a paper bag. Both allow your bread to breath whilst slowing moisture loss, keeping it fresher, longer. …and finally, keep in the dark in your bread bin, preferably one handcrafted from wood and made in the Cotswolds! P.S. We’d be interested to know what treasures, other than bread of course, you have found in your bread bin … no mouldy replies please! !